Screen capture of the Express Pizza of Maple Ridge BC home page. 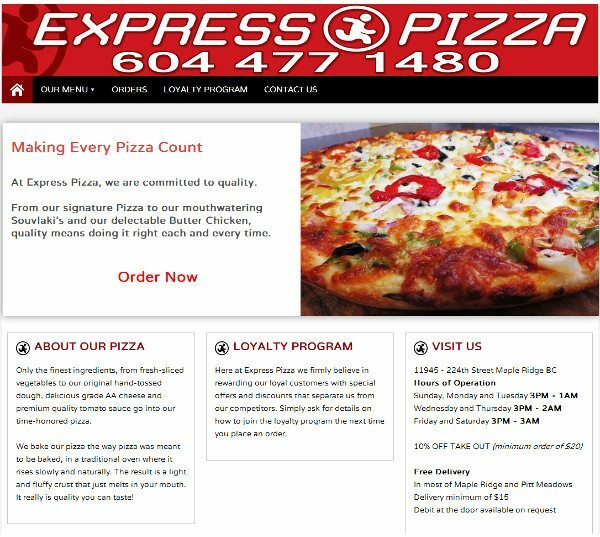 Express Pizza has been delivering pizza and other ethnic foods to the Maple Ridge and Pitt Meadows regions for a few years but have had problems maintaining a web presence. As such they had very poor representation within the search engines as well as having no menu online for potential customers to reference. The owners of Express Pizza commissioned Black Chip to create a proper website that communicated with both search engines and their customers about what they had to offer and where they were located. After further discussion it was decided that Express Pizza would also like to take their own orders online and to offer a loyalty program. Knowing that the owners of the business had little knowledge on web development and maintenance, coupled with budgetary concerns, we thought that they would be best served by developing their web presence on a WordPress CMS. Further, using WordPress would also allow for them to reduce expenses by using themes. With the hosting, CMS and basic layout and design taken care of it was time to address their menu and online ordering system, for this we used the WPPizza plugin which addressed both needs. For their Loyalty Program and SMS marketing we used a white label service that allows us to not only monitor their progress but also allows us to train the clients on how to maximize their text marketing campaigns. In a few short weeks Express Pizza now ranks for some very good keywords in localized search, they no longer need to rely upon third party online ordering providers who take 10% off of the top of each order and they now have a reliable Loyalty Program that helps to build customer lists that they can re-market to.